Nearly 180 years ago, President Andrew Jackson handed a letter to a military officer with a message for two American Indian tribes: Leave Mississippi and Alabama, or else. His direct language was the start of federal efforts that led to the forced relocation of five tribes and the infamous "Trail of Tears," as thousands of Indians died from starvation, exposure, and disease. But historians have always had to depend on a draft of Jackson's message - not the final copy carried by Maj. David Haley to Choctaw and Chicasaw leaders. It was believed lost to history. Forgotten in a private family collection, the letter was discovered this summer, and sold to the Raab Collection, a Philadelphia-based dealer of autographs, historical documents and manuscripts. It was resold last week by the Raabs to a "major collector of American documents" in New Jersey for a price "well into five figures," said Nathan Raab, vice president of the Raab Collection, who declined to identify the buyer. "This is a once-in-a-lifetime find," said Raab. "It's one of the most important documents in American history. To discover it after nearly two centuries is nothing short of breathtaking." Images of the letter will be posted today at www.raabcollection.com. Research-related inquiries about it can be directed to the collection through the Web site. The find has enthralled academics, historians, and librarians. "From a historical point of view, what it documents is a pivotal point in relations between the federal government and Native American tribes," said Leslie Morris, curator of modern books and manuscripts at the Houghton Library at Harvard University. "From a curatorial point of view, it's something you would want if you're doing an exhibition on this topic. It's evocative. [The paper] is very well worn as if it had been carried around." The draft and original "are similar but different in tone. Reading it now gives a sense of immediacy. . . . The fact that it survived at all is remarkable." In the letter, "Jackson sets in motion the punishing policy of Indian resettlement," said Andy Waskie, a historian, author, and Temple University professor who teaches languages and history. ". . . By all appearances, this is a very historic document. This could be a windfall find." Jackson's message - which indicates it was directly presented to Haley by the president - captured a crucial moment in history while offering fresh insights, especially when comparing the final copy with the draft. The words, written in a graceful cursive by the president, were intended to coax and cajole his "friends" and "brethren" to relocate to lands in what is now Oklahoma. They also carried a clear threat. 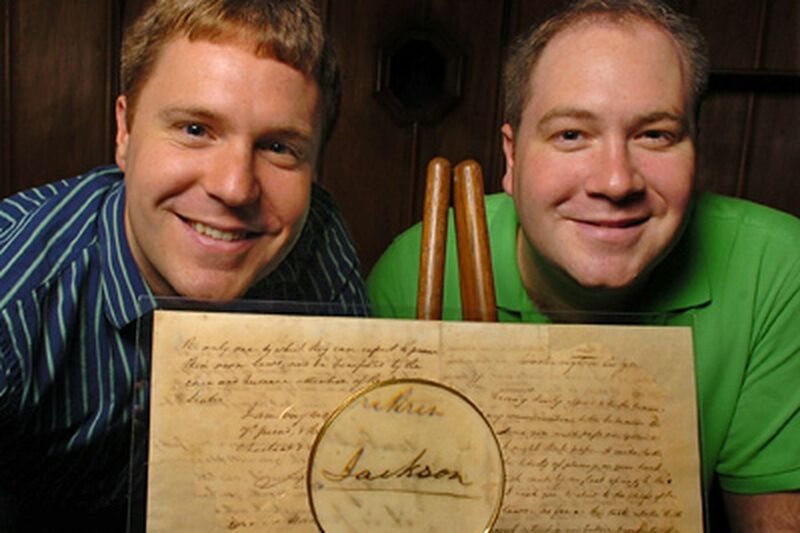 "Say to them as friends and brothers to listen[to] the voice of their father, & friend," Jackson wrote. "Where [they] now are, they and my white children are too near each other to live in harmony & peace. Their game is destroyed and many of their people will not work & till the earth. Beyond the great river Mississippi, where a part of their nation has gone, their father has provided a co[untry] large enough for them all, and he ad[vises] them to go to it." Jackson made subtle changes in the letter given to Haley. In the published draft, he told the tribes they must move if they want to "preserve their Nation." That threatening language was removed and replaced with wording - in the final letter - that still implied a threat. ". . . Tell them to listen," Jackson wrote. "[The proposed plan] is the only one by which [they can be] perpetuated as a nation . . . the only one by which they can expect to preserve their own laws, & be benefitted by the care and humane attention of the United States. I am very respectfully yr. friend, & the friend of my Choctaw & Chickasaw brethren. Andrew Jackson." "What stands out was the tone Jackson takes," said Raab. "It was not uncommon in his letters to find this direct language. Yet he adopts some language that would appeal to these Native American nations when he speaks of himself as their father and calls them his children and brethren." Choctaw Chief David Folsom, who had been a Jackson military subordinate years earlier, received the message on Nov. 29, 1829, and reportedly rejected it on Dec. 14. By May 1830, Jackson signed into law the Indian Removal Act, which led to the "Trail of Tears." The Choctaw were the first to be relocated, in 1831, followed by the Seminole in 1832, the Creek in 1834, the Chickasaw in 1837, and Cherokee in 1838. "From my perspective, we opened the door on history; we see Jackson differently," said Raab. "Looking at a draft is not the same thing as experiencing the event as the native tribes would have. "The past has a habit of jumping out at you," he said. "That's what happened here. A crucial moment has bounded nearly two centuries into the future - and allowed us to experience a momentous, defining event. We are still seeing the repercussions of events set in motion long ago."